Dating Athletic Singles - Find New Love! Dating Athletic Singles is for single men & women with a focus on fitness & those that want to love them. Browse through profiles of people just like you...or maybe even a little cuter. Join for free! Get ready! Get set! Date! Fitness Dating has been designed for singles how are active and who consider fitness important in their life. If you are looking for a fun, fit romantic partner, then this might be the site for you. Feel free to join for free and begin checking out all the fitness focused singles near you. Athletic Passions is a free dating site for athletic singles with active lifestyles. Join for free and take advantage of free email, chat, forums and more. "Playing sports? Eating healthy? Working out at the gym? Going hiking? Yoga? Whatever it means to you, Fitness-Singles.com is the fastest-growing online dating community for sports and fitness enthusiasts. Whether you’re looking for romance or friendship, Fitness-Singles.com is a fun, private and secure environment to meet active, health-conscious singles!" Niche dating has exploded online, providing sites that are exclusively focused on one particular group of people (and the people who are interested in that group). If you are interested in the Fitness community, Fitness Dating Connexion is the site for you. It only takes minutes to create a free account, and then you are free to check out the singles who have also been drawn to this site. You can't meet someone just by looking at the homepage, so join...and start having fun! Race results and social networking for endurance athletes. 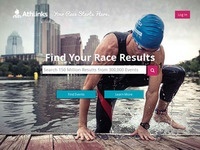 While not a 'dating' site, Athlinks is filled with fit individuals who participate in a number of different athletic pursuits, including running, triathlon, swimming, cycling, mountain biking and more. Find members based on what type of sport they participate in, the group or club they are in, or just by browsing race results. Additionally, you can browse Athlinks members by gender, age and location.